4. William Ortiz riding the Colorado sky! 6. Local Chris Fernandez rippin' up the park! 7. The rail of death. 8. The Rockies of Trinidad Skatepark. 10. Rollin' hills of Trinidad Skatepark. 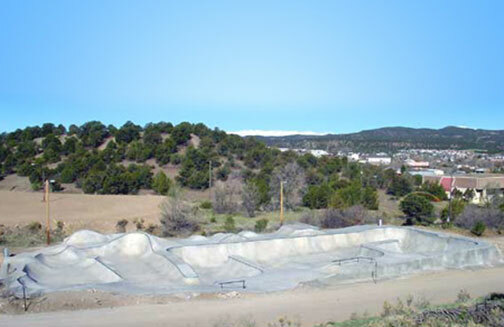 Trinidad Skatepark is one of southern Colorado's newest skateparks. This free 15,000 sq. 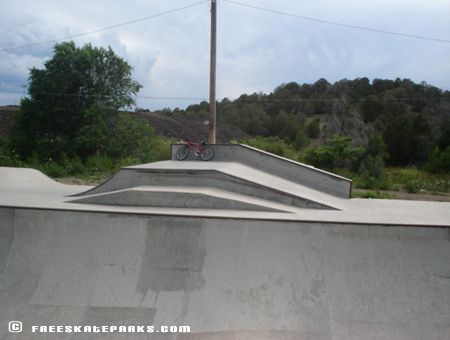 ft. concrete skatepark facility was completed in May 2003 and has earned rave reviews from everyone who has the opportunity to take advantage of this skateparks' awesome layout. 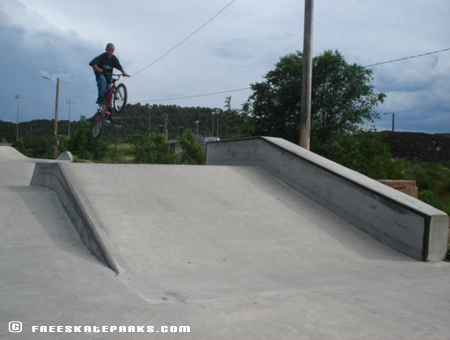 Most locals seem to prefer skateparks that are free. 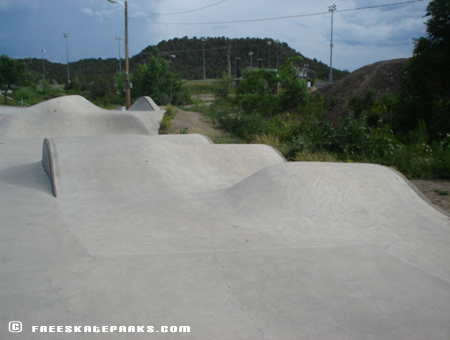 This park built by Grindline Skateparks is definitely one of the top skateparks in Colorado. 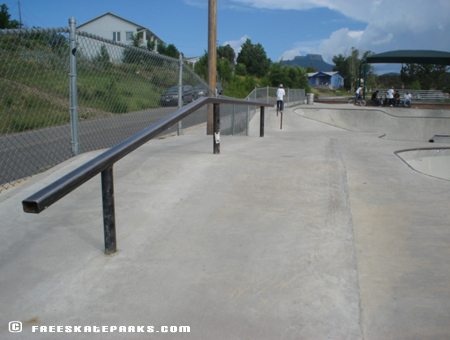 Most skateparks Grindline constructs are free and unsupervised. They have built in a near infinite number of lines and unique features make this spot skateable for days. Not to mention its free. You need to get to Trinidad immediately! After almost three years of planning and construction, the $205,000 skatepark is considered one of the best free skateparks in Colorado. Complaints of kinks, poor design and bad lines are non-existant and skaters seem to think it'll be hard to outgrow this skatepark, no matter how good their skills. Skaters have come from all over to get a taste of Trinidad Skateparks' smooth bowls and endless lines. Colorado is known for its free skateparks and when Grindline builds it, you know the skatepark is going to last. Their business is skateparks. 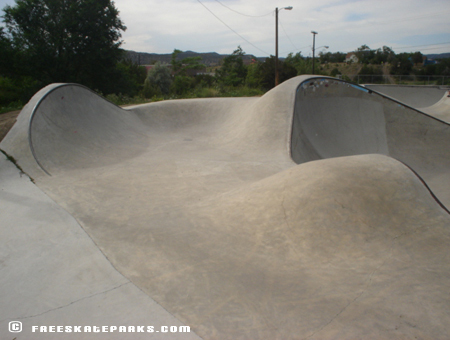 Concrete skateparks are what Grindline does best! 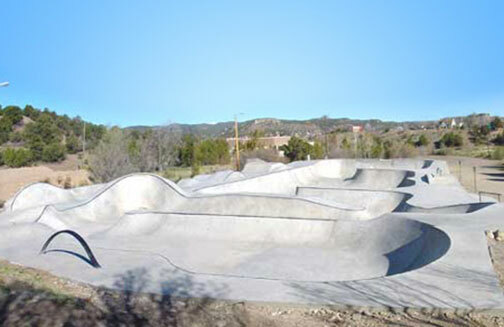 Funding for Trindad Skateparks' construction came from Great Outdoors Colorado ($130,000), The City of Trinidad ($35,000), in-kind private donations ($30,000), and Ride in Peace members (almost $10,000). Ride in Peace is a Trindad area skateboarders and cyclists organization. 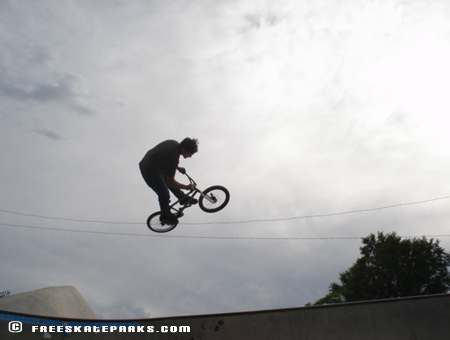 The skateparks's creation was spawned mainly by interest of local kids who hounded city planners for a place to skate. With the creation of the Trinidad Skatepark, the soccer park and the second phase of the Trinidad Riverwalk, city officials have "shown their determination to provide recreational amenities for the community." 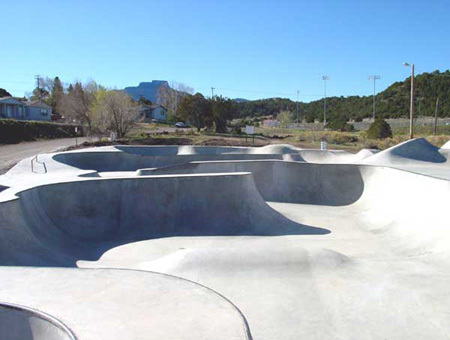 Thanks to the efforts of the City of Trinidad, Council of Governments (COG), Las Animas County, Great Outdoors Colorado (GOCO), Grindline, Ride In Peace (RIP), and many local contributors, Trinidad has joined the ranks of Colorado cities that have built free skateparks. In case of a serious emergency, always call 911. USE OF THIS SKATEPARK IS AT YOUR OWN RISK - Skateboard within your abilities and have fun! The City of Trinidad reserves the right to revoke use of the site privileges for individuals that do not follow the regulations. 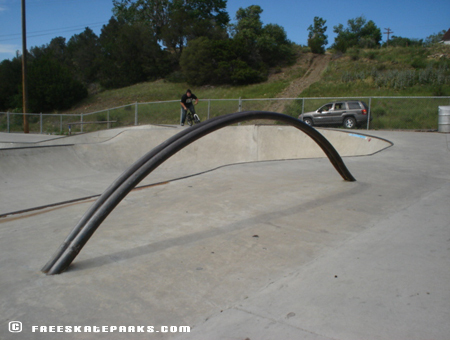 Pegs on bicycles MUST be Skatepark friendly - rounded at the ends to protect the skateparks' surface (plastic covers preferred). No modifications to the Skatepark or makeshift items allowed on or in the premises. Loud music will not be tolerated at ANY TIME. Keep food and beverages off the skating surface and use the trash cans. KEEP OUR SKATEPARK CLEAN! Spectators should observe from outside the skatepark area.